Teachers and school districts have found MobyMax particularly valuable when it comes to RTI. “Four years ago, our district began to develop a new RTI plan, with the goal of implementing a streamlined, reliable diagnostic method and ongoing assessments,” said Erin Redden, Director of Accountability and Instructional Support with Caddo Parish Schools in Louisiana. “We turned to MobyMax, which now plays an integral role in our district’s RTI strategy by providing tools that quickly assess student proficiency in each standard of the Common Core. “MobyMax allowed us to reduce the number of tools we used overall, and at an exponential reduction in cost for our district!” Redden reported. “More than 1,400 education technology professionals, including IT staff and educators, spoke out about the tools they think have the most positive impact on the mission of education,” says David Nagel, editor-in-chief of THE Journal and editorial director for 1105 Media’s Education Group. Nagel said that "hundreds of products” were nominated in dozens of categories this year, which makes the accolades MobyMax received particularly noteworthy. 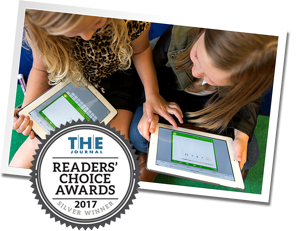 2016 Education Software Review Awards for Best Multi-Subject Website (Early and Upper Elementary), Best Multi-Level Website, and Best Teacher Tools. But MobyMax won’t be resting on its laurels. It’s busy wrapping up 2017 by rolling out its new Pinpoint Assessments product, which allows teachers to drill down on discrete skills to get an instant snapshot of where students are. Stand by for even more revolutionary product offerings in 2018! MobyMax, the nation’s leader in personalized learning curriculum for grades K-8, unlocks the power of personalized and blended learning to help students learn twice as fast. The company offers the only complete and comprehensive K-8 curriculum for 27 subjects, including math, reading, phonics, language, vocabulary, spelling, writing, science, social studies, and state test prep. MobyMax finds and fixes learning gaps to help students increase one full grade level in just 40 hours. MobyMax’s comprehensive solution includes diagnostic testing, assessments, progress monitoring, IEPs, student response system, whiteboard activities, and student motivation prizes, badges, and games. For the 2016-2017 school year, MobyMax was used in more than 82% of all K-8 schools in the United States. THE Journal is the premier resource for K-12 senior-level district and school administrators, IT administration and instructional technologists who make decisions and influence technology purchases for their districts, schools and classrooms. For more information, visit www.thejournal.com.